PINEHURST, N.C. - Martin Kaymer returned to the elite in golf with a U.S. Open victory that ranks among the best. A forgotten star for two years while building a complete game, Kaymer turned the toughest test of golf into a runaway at Pinehurst No. 2 on Sunday to become only the seventh wire-to-wire winner in 114 years of the U.S. Open. Kaymer closed with a 1-under 69 - the only player from the last eight groups to break par - for an eight-shot victory over Rickie Fowler and Erik Compton, the two-time heart transplant recipient and the only player who even remotely challenged the 29-year-old German. So dominant was Kaymer that no one got closer than four shots over the final 48 holes. Only a late bogey kept Kaymer from joining Tiger Woods and Rory McIlroy as the only players to finish a U.S. Open in double digits under par. He made a 15-foot par putt on the 18th hole, dropping his putter as the ball fell into the center of the cup, just like so many other putts this week. "No one was catching Kaymer this week," Compton said, who closed with a 72 to earn earned a trip to the Masters next April. "I was playing for second. I think we all were playing for second." This U.S. Open really ended on Friday. 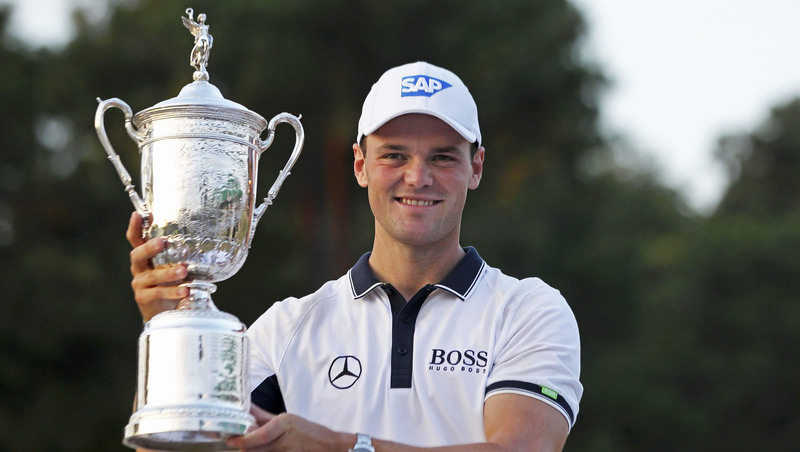 Kaymer set the U.S. Open record with back-to-back rounds of 65 to set the pace at 10-under 130. He began Sunday with a five-shot lead, and after a 10-foot par save on the second hole, Kaymer belted a driver on the 313-yard third hole. The ball landed on the front of the green and rolled to the back, setting up a two-putt birdie. "He kind of killed the event in the first two days," Henrik Stenson said. "He went out and shot two 65s and left everyone in the dust." Fowler, in the final group of a major for the first time, fell back quickly on the fourth hole. He sent his third shot from a sandy path over the green and into some pine trees and had to make a 25-foot putt just to escape with double bogey. Fowler played even par the rest of the way for a 72. Compton birdied the eighth hole and got within four shots until he took bogey on the par-3 ninth, and Kaymer followed with an 8-iron to 4 feet for birdie. Kaymer finished at 9-under 271, the second-lowest score in U.S. Open history next to McIlroy's 268 at Congressional in 2011. He won his second major - the other was the 2010 PGA Championship at Whistling Straits in a three-man playoff - and this one wasn't close. "Martin was playing his own tournament," Fowler said. Kaymer joined Seve Ballesteros, Ernie Els, Woods and McIlroy as the only players to win two majors and be No. 1 in the world before turning 30 since the world ranking began in 1986. He is the fourth European in the last five years to win the U.S. Open, after Europeans had gone 40 years without this title. It's a rebirth for Kaymer, who reached No. 1 in the world in February 2011, only to believe that he needed a more rounded game. His preferred shot was a fade. Kaymer spent two hard years, a lot of lonely hours on the range in Germany and his home in Scottsdale, Arizona. He fell as low as No. 63 in the world until going wire-to-wire (with ties) at The Players Championship, considered the strongest and deepest field in golf. But the big payoff came at Pinehurst No. 2. "I didn't make many mistakes the last two wins that I had in America - especially this week," said Kaymer, who moves to No. 11 in the world. Kaymer has as many majors as Bernhard Langer, the two-time Masters champion and a mentor to Kaymer. Langer sent him text messages earlier in the week. "We've almost a German Grand Slam - almost," Kaymer said. "I hope it will make Bernhard proud. I'm sure it will make all of Germany proud." The biggest challenge for Kaymer was tuning out the crowd, with enormous support for Fowler, who enjoys pop star qualities in America. The fans clapped when Kaymer's ball bounded off the back of the green, and even when a superb shot from the native weeds on No. 4 rolled off the front of the green. He marched along, dropping a shot on No. 7 with a shot left of the green that made him play away from a bunker to avoid a score worse than bogey, and another on the par-5 10th when a shot from the sandy area sailed over the green, and he used putter to send the next shot back toward the fairway. But after back-to-back birdies, including a 30-footer on the 14th, the only question left was the margin. Woods still holds the most dominant U.S. Open win - 15 shots at Pebble Beach in 2000. McIlroy won by eight shots on rain-softened Congressional in 2011, winning with a record score of 16-under 268. "I'm wondering how he did it," McIlroy said. "Obviously, if you limit the mistakes, you might end up a couple under for the week. But to do what he's doing ... I think it's nearly more impressive than what I did at Congressional." Kaymer's father was home in Germany, where he said Father's Day was celebrated a few weeks ago. "I didn't get anything for my father that day," Kaymer said. "So maybe this works." Among those who congratulated Kaymer on the 18th green was Sandra Gal, a German player on the LPGA Tour. The Women's U.S. Open takes over Pinehurst No. 2 on Monday.